Haryana Chief Minister Bhupinder Singh Hooda today announced to waive off the interest amount of Rs 4.68 crore of 1,894 small entrepreneurs, rural units and artisans so as to motivate them to deposit the principal loan amount. Showing concern over official delay in the sanction of estimates for repair of roads, finance minister Birender Singh today directed the chief administrator, HUDA, to come to Gurgaon for the purpose. He also instructed the concerned officers to get the patch work done on all roads here by June 30. Commercial activities are going on unchecked along the GT road, which is among the most accident-prone highways of the country. The state police has turned a blind eye to the traffic nuisance caused by vendors in the district. The Haryana Board of School Education has made certain amendments in the state teachers eligibility test (STET) - 2008 to be conducted by the board for elementary teachers on July 27, for heads on August 3, for masters and mistresses on August 10 and for lecturers on August 17. HSIIDC or real estate agent? Holding head constable Jayender Singh and sub-inspector Jagbir Singh guilty of being inefficient in providing security to newly married Babli and Manoj, Kaithal SSP Anil Kumar Rao dismissed the head constable and imposed the penalty of cut of two increments on the two. Haryana power, water supply and sanitation minister Randeep Singh Surjewala claimed here today that during the three years rule of the Congress govt organised crime had completely been eliminated from the state and hence the Congress had fulfilled its election promise of providing a crime-free environment in the state. The arguments on framing charges against Dera Sacha Sauda chief Gurmeet Ram Rahim Singh in the sexual exploitation case of sadhvis were concluded in the CBI court here today. Special Judge of the CBI court A.K. Verma adjourned the hearing till July 5. Rather then devouring the history books to understand what transpired before the 1857 revolt-nation’s first struggle for freedom - a 22-year-old English student from Edinburgh University of Scotland has set out on a journey to relive the revolt. As many as 5,200 farmers from the Karnal circle of the Punjab National Bank (PNB) are expected to reap benefit under the loan waiver scheme launched by the Centre. Five women, apparently of the same family, were killed after they were run over by a speeding train at Madanpura village, 30 km from here, this evening. Residents and members of the village panchayat of Gobindpura village staged a demonstration and blocked the traffic on the national highway number 71 here today. The officials concerned had to intervene to end the protest. The Rai police foiled an attempt of kidnapping of an industrialist from his unit in the Rai industrial area by five gangsters late last night. The police today unearthed two factories that were bottling fake Pepsi cola at Bhuna town in the district. Three persons were killed and five others sustained injuries in a road accident near Khanpur village here today. He said it had also been decided to waive the principal as well as interest amount of about Rs 5.75 crore of 2,880 expired, untraceable and incapable loanees. The Chief Minister said the Industries Department had provided financial assistance to these entrepreneurs in shape of loan and subsidy under different schemes since 1966. The loan was given to the beneficiaries under the schemes margin money, seed money, the State Aid to Industries Act and the Mewat Development Agency. Hooda maintained that due to non payment of funds by the beneficiaries, the loan amount given to them had increased manifold thus making them unable to pay the principal and penal interest. As a sympathetic gesture, relief was given to these loanees by waiving their interest amount. At the same time it would result in immediate recovery of balance principal amount of the loan, he added. While enumerating the details of the loanees, he said out of 4,774 loanees, who had availed loan under different schemes since 1966, the outstanding amount of 2,880 beneficiaries could not be recovered due their being expired, untraceable and incapable. Department and the principal amount was recovered from them was Rs.1.38 crore while interest of Rs1.68 crore was recovered from them. The principal amount of Rs1.40 crore and interest of Rs 9.52 crore was to be recovered from them. The minister gave the direction after the issue of pitiable condition of roads was raised by the nominated members during the monthly meeting of the District Grievances Committee presided over by him. When he enquired about the roads in the residential sectors developed by HUDA, he was told that their repair was hanging fire since their estimates were not yet sanctioned by the chief administrator’s office in Chandigarh. At this, he ordered the chief administrator to come to Gurgaon and sanction the estimates pending with his office. He directed DC Rakesh Gupta and HUDA officials to convey this to the chief administrator. The minister added that he would not like to hear anymore that the estimates of the development works sent to their headquarters in Chandigarh remained pending. He also fixed deadline for the repair of various roads and asked the nominated member, who was raising the issue, to give a copy of list of roads to him, the DC as well as to the officer of the concerned department responsible for maintenance of the road. He directed that the local Gurudwara road, Badshahpur road be repaired in 15 days and to expedite the construction work of Railway over bridge at Daultabad. He said he would review the work done in the next monthly meeting. 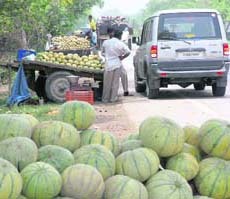 A visit by The Tribune team to the NH-1 today, revealed that muskmelon vendors had stationed their reharis along the GT road. The stretch between the old toll plaza in Karnal and Tarauri is among the worst affected areas. Parking of buses, trucks and even vehicles with red beacon in a haphazard manner, along the GT road, to purchase fruit posed a threat to the motorists. These sellers were carrying their commercial activities for the past several days, but the district and the national highway police authorities had failed to take notice of the problem. The vendors disrupt the drivers in an attempt to grab their attention. They even disrupt smooth flow of the traffic on the road. AIG (highways) Rajpal Singh said he would take up the matter with the Karnal district police and the secretary RTA. He assured to clear the nuisance with immediate affect. While stating this here today, a spokesman of the board said the education department would not recruit anyone as crafts and vernacular teachers as the term had been removed from the list. It had been decided that instead of recruiting teachers for Hindi, Punjabi and Sanskrit, teachers would be recruited as mister and mistresses of the language concerned. He said it was made mandatory in the prospectus to have a BEd degree as well as a graduation degree in the subject concerned for the master category. It had also been decided in principle that along with graduation, the candidate should have studied the subject concerned in BEd also. In the case of language master, it was necessary for the candidate to have studied the same subject at the BEd level. The degree of shashtri would be considered valid for the post of Sanskrit master or mistress. He said the Haryana Staff Selection Commission would recruit only those candidates who fulfilled all service norms required for the selection. Only the clearance of this test would not entitle the candidate for recruitment as teachers. He said the two papers of awareness and aptitude test and subject knowledge test of two and a half hours each would also be conducted. The minimum pass marks for the candidates of general category would be 50 per cent and 45 per cent for candidates belonging to the reserved category. The certificate issued by the board would be valid for five years. The prospectus was available at the board headquarter, Bhiwani, authorised branches of Punjab National Bank situated at the tehsil level of Haryana, Axis Bank, Bhiwani branch, and board-prescribed booksellers. The orders were pronounced on April 29, a copy of which was sought through the Right to Information Act. Jayender Singh had connived with one of the murder accused Gurdev Singh in the honour killing of Babli and Manoj on June 15, 2007. As per the report, Jayender informed Gurdev Singh about the location of the police team as well as that of Babli and Manoj over his mobile phone. Regarding the conduct of Jagbir Singh, the SSP observed, “It is correct that the deceased couple had given in writing not to take police security any further, but Jagbir Singh was well aware that there was a threat to their lives from the relatives of the girl. Manoj and Babli of Karoda village (near Kaithal) had married against the wishes of Babli’s parents. The couple was allegedly murdered by relatives of Babli, including Gurdev Singh, Babli’s cousin (materal uncle’s son). While addressing a press conference here today, Surjewala said 38 criminals were killed in police encounters in the state and now the criminals were demoralised and could not dare to indulge in crime. He said there was no doubt that there were stray crime-related incidents but by and large the situation was peaceful. Making a scathing attack on Chautala family for providing patronage to criminals, Surjewala alleged that before the Congress took reigns of the state after the last Assembly elections, the criminals had political patronage hence the crime graph had risen sharply in the state. Businessmen and professionals had to pay huge sums as extortion money and number of them had to migrate to other states. The arguments on framing charges in the Ranjit Singh and Ram Chander Chattarpati murder cases are yet to begin. Besides the dera chief, around half a dozen devotees of the dera chief have been accused in these cases by the CBI. Defence counsel Surya Prakash said he had produced several facts in the notice of court in support of the dera chief. He said a senior officer of the CBI had committed in the high court that investigation in these cases had been completed. Later, the CBI recorded statements of several sadhvis of the dera and threatened them that their statements had been recorded under Section 164 and they had to face legal action if the backed out from their statement. He alleged that the inquiry officer of the case had investigated the case in a partial manner and the police had tortured one of the devotees of the dera chief, Krishan Lal, during police investigation and pressurised him to give statement against the dera chief. Refuting the charges of the defence counsel, CBI counsel S.P.S. Verma said the CBI had sufficient witnesses and evidences against the dera chief in the case. The CBI had statements of several sadhvis in the case. He said the CBI had completed its argument in this case. The dera chief reached the court at 10 am and remained there for around three hours. According to information, after repeated requests of the dera chief, the judge allowed him to sit on health grounds during the proceeding of arguments. The district administration did not allow the dera chief to address his followers in HUDA grounds at Ambala city due to security reasons. 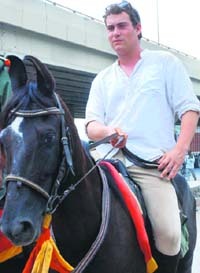 Having developed intense interest in Indian history, Oliver Cockidge Bolen Briars decided to travel from Shimla to New Delhi, mounted on a horse. During his nine-day journey he halted at places where the British troops had camped, while they were sent to Delhi from Shimla to crush the revolt. Speaking to The Tribune, Oliver, who was halting at Panipat, said the people in England were hardly aware of the 1857 revolt. A student of MA history, he said when he began reading about India, he felt great respect for the people of this country, who had died for the cause of their nation. He said some in England call it a mutiny, some a religious war and some see it as a peasant rebellion. “But I want to understand it in a better way and so I came here and undertook this journey”, he said. Oliver said from the research that he had carried out so far, he felt that whatever had happened was tragic but whether it was right or wrong was not for him to say. Instead he wanted to help people know bare facts of the history. During his journey, this young historian held interactions with the local people, which he claimed had broadened his perspectives about the social undercurrents that had led to the 1857 revolt. “Though the times have changed, but the social fabric of the country still remains the same and this has gone a long way in improving my perceptive of India,” he said. After completing his journey at New Delhi he will be going to Meerut, which was of significant importance. Interestingly, Oliver is undertaking this journey on a horse of a Marwari and Khatwari breed, which the British had tried to eliminate during their rule. The horses and other equipment for the journey has been made available by Indigenous Horse Society of India, a Rajasthan based organisation. Raghuvendra Singh Dundlod, secretary of the society, who is also travelling along with Oliver, said it was an enriching experience for him. Executive director of the bank K. Raghuraman said today that the bank would display the names of the beneficiaries by June 20 at their respective branches. He said the special training programme was held to make the staff aware of the waiver plan. Branches of Karnal, Panipat and Sonepat fall under the jurisdiction of the local PNB circle. He said under the agriculture debt waiver and debt relief scheme 2008, loans of 3,200 farmers would be exempted fully and 2,000 small and marginal farmers would also be benefited. The deceased included a 60-year-old woman, a teenager and three women of around 30 years of age. None of them have been identified as yet. They were run over by the Ludhiana-Hisar passenger train. It was not yet known whether it was an accident or a case of suicide. The police have begun investigations. UNI adds: The women suddenly jumped on the tracks and huddled together as the train came hurtling down after leaving the nearby Jakhal railway station. Four of the women died on the spot while the old woman succumbed to her injuries in a hospital. The protest was led by the sarpanch, who demanded immediate removal of the illegal liquor shop located near the village. According to Karambir Singh, a member of the gram panchayat, the liquor mafia was operating unauthorised liquor shop for the past few months. He said this shop was earlier in the Municipal limits, but was shifted to a place near the railway crossing to have improved sale. The panchayat passed a resolution demanding its closure. But the authorities concerned failed to take an action so far. “The shop had proved fatal, as three persons had lost their lives in rail accidents, when they tried to cross the line in an inebriated condition,” said Lakhmiram, another member. The gangsters were forced to leave behind the kidnapped trader in his car near Rohat village as they were being chased by the police. The police has registered a case of attempt to kidnapping against the unidentified gangsters. Industrialist Kailash Chander, resident of Delhi, was kidnapped on gun point by four gangsters when he was reportedly coming out of his unit in his car yesterday around 8 pm. After noticing that the industrialist had been kidnapped, the workers in the unit raised alarm and informed the police. The police swung into action and alerted all police nakas immediately. The police recovered 71 crates of fake soft drinks from these factories and arrested two persons in the connection. Surender Arora and Dharam Pal, regional sales officers of the Pepsi, Gurgaon, had informed the police that some people had been bottling fake Pepsi cola in empty bottles of the company. The officials of the company said they were getting reports of sales of fake soft drinks in the area for quite some time. When they inquired from the market, they found that two factories, at model town, Bhuna and Ramlila grounds, were selling fake drinks. They went to these factories posing as customers and ordered for 10 crates of the soft drink on a future date, which the factory owners readily agreed to supply. They reported the matter to SP Saurabh Singh, who constituted a team to raid the factories. The police raided Sachdeva Soda Factory and Vinod Cold Drinks Factory. It arrested their owners Ramesh and Vinod, respectively, from the spot. The police has booked them under Sections 272, 273 and 420 of the IPC. Neelima and Manu died on the spot, while Poonam died on the way to the Karnal trauma center. According to the police, Tata Safari of the deceased was hit by a truck. Sources said Kuldeep, Nimish, Nikhil, Neeraj Gupta and driver Pawan sustained injuries in the accident. A case has been registered against the unknown driver of the truck (HR-69-C-2127), who fled away from the spot after the mishap.